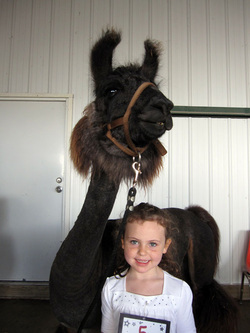 Thank you for exploring our web pages as you seek information on llamas for sale. We typically have several lovely llamas that are available for you to purchase for your next show prospects, breeding animals, fiber producers and/or companions for the trail. Please inquire about our current sales list. We handle our llamas daily and get them comfortable with routine activities like toenail trimming, shearing and hiking on the trail, so they make fun companions as well as great show animals. If you'd like to see our llamas up close and personal, refer to the collection of videos we keep on our youtube channel. I am available to teach lessons in llama handling and training. If you'd like to come to the farm for an individual lesson, or if you'd like to join a group lesson, or trail hiking group, please use the contact form on the website to get in touch with us. 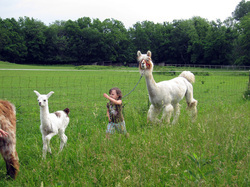 Petals is being handled and worked with by the kids who leased llamas from us in 2012. She is available for sale. Petals is a very laid-back llama. She makes things like grooming, toenail trimming and obstacle training very easy. If you're a first time llama owner, she would be a great llama to start with. She is very curious and enjoys the company of humans. She is a small llama and has scrumptious silky fiber. To see more photos of Petals, you can visit her page in our photo album at Flickr. This is Heartsong Velvet Petals when she was about 2 weeks old, enjoying a hike on the farm with her mum, and her junior handler, Abigail.